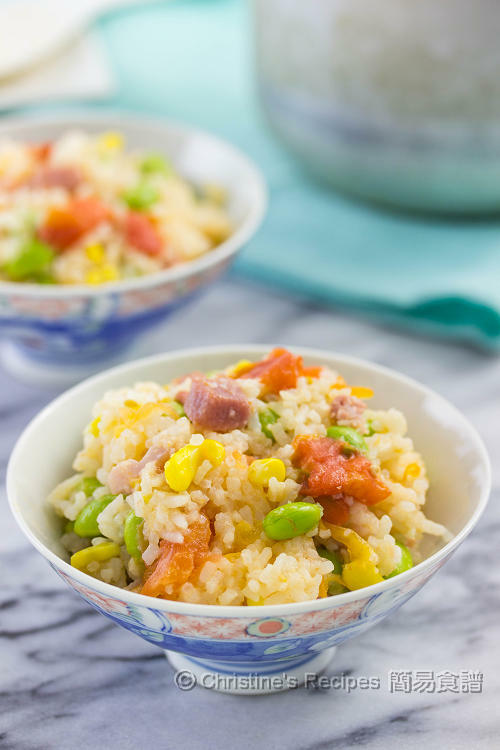 This one-pot rice dish has been so epic and crazily circulated around on the internet. As I grew up with one-pot rice and often made this kind of rice for my family, like Shiitake mushrooms and chicken rice. Often times, I cook tomato dishes for my family. It shouldn't surprise me at all. What intrigued me is that a whole tomato is going to be placed in a rice cooker (or a pot) to make a meal. 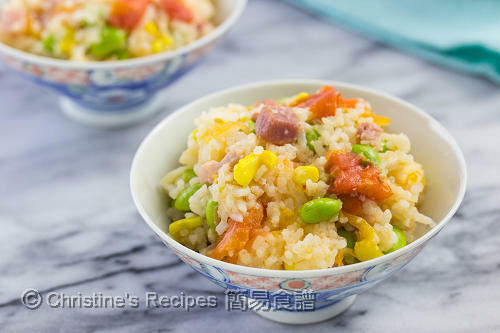 Even better, you can make your own creative versions with many extra vegetables or meats you like. Here's my version, I added some Edamame beans (immature soybeans in the pod) that you might have tasted at sushi bars and found in the Taiwanese and Japanese cuisines. These little beans are flavoursome and rich in protein and plant sterols. That said, Edamame beans can help lower cancer risk too. On top of that, some bacon dices were added to suit the taste buds of the meatlovers in the family. You might like to tweak this recipe with your own preferred meats and vegetables. Or skip the meat and turn it into a vegan dish. What is the final verdict after my trying this whole tomato rice? I’ve already marked it as a high-priority recipe in my family menu just in case for a hectic day. Rinse and cook rice with water in a rice cooker. Just use 80% of water as usual. Trim away the stem from the tomato. Use a sharp knife to score a cross slit at the bottom of the tomato Place it in the middle of pot. Add corn kernels, salt, sugar and oil. Cook until the rice is done. While cooking rice, sauté the bacon until aromatic and release some oil. Absorb the excess oil with kitchen paper. Set aside. Boil the beans in salted boiling water until cooked through. Drain, peel and set aside. When the rice is done, mash the tomato. Stir in the beans and bacon. Season with salt and soy sauce if needed. Serve hot. I used frozen beans in pods this time. They are already cooked and very handy, available at Asian grocers. You might like to use fresh, or those without the pods. As the amount of water contained in every tomato is quite different. Please adjust the amount of water to cook rice accordingly. You might make this rice on a stove, also using 80% of water that you used to cook rice. I love one pot meals. This is very tasty and healthy as well, Christine. Oh Lalla La. Looking so tasty and delicious. I want to make this recipe and eat it alone. My family also likes this dish. So I will make it for me and my family. I really appreciate this tomato recipe. I made this recipe last night. I expected it to be good, and it was really very tasty and delicious. Thank you so much for sharing this. Thanks for your encouraging words. 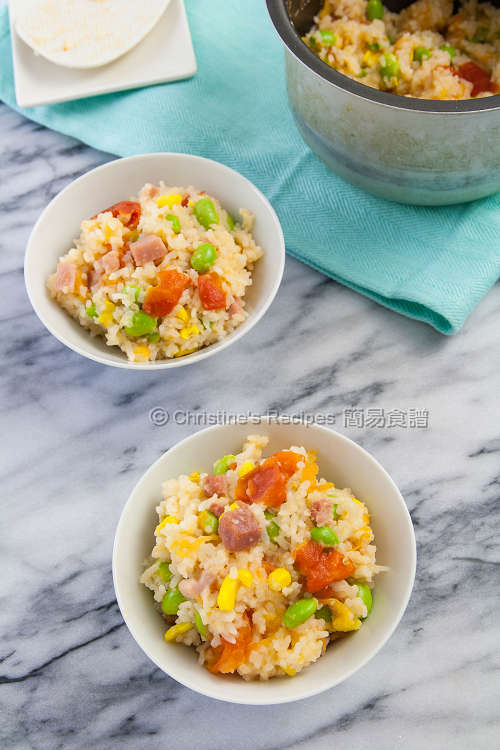 Chinese sausage is good for making this rice. Yum ! I have a Mac too and can browse my site without any problem. Where does she live? That would be a problem to visit my page if she's based in China. She lives in NYC, like me. She's not sure how it happened. Will ask her to try it again (sometimes things happen with computers that defy logic). What I did was send her a printable version of the recipe so at least she could read it. I've subscribed to your site, so I'll keep her posted on the fine recipes you make! You even make your own don tot! Fabulous! I see. Hope she can find a way to fix the browsing problem. Thanks so much for dropping by. Welcome to come back for more delicious recipes. made this last night and it was a good low-effort meal. would love more one pot recipes (that aren't instant pot). :D growing up, I don't think we made any one pot meals at all, maybe not too common with chinese families, or just mine! My mum used to cook one-pot rice as she worked full-time. It saved lots of effort and time. 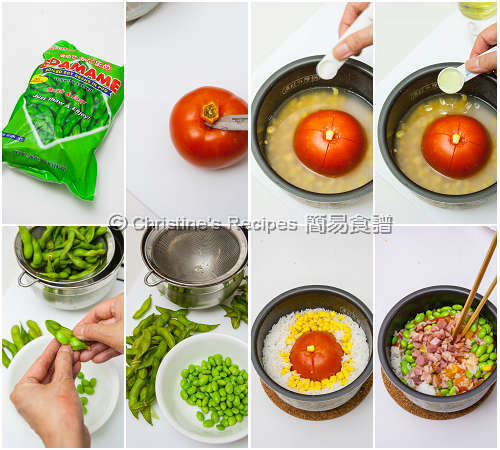 Hi Christine, is there any substitute for edamame? Thanks! Hi, you can use green peas, or just skip it.